Sunscald is a condition common to tomatoes and peppers when they are exposed to the direct rays of the sun during hot weather. The condition causes pale white or yellowish blotches on the fruit where the sun’s rays are most intense. It’s more common on developing green fruit but sunscald can affect mature tomato fruit just as often. Sunscald is especially prevalent when maturing fruit suddenly becomes exposed to the direct rays of the sun, often after the removal of foliage due to disease. That’s what happened to the tomato in the picture above. Fruit that was protected by shade is suddenly exposed to an intensity level that it simply can’t endure. With continued exposure, damage can progress beyond pale discoloration, quickly leading to a paper-like skin or sunken areas beneath. The color of the sunscalded area takes on a white or light grayish look. Black mold can begin to develop as the fruit continues to deteriorate. In my garden, every bed gets about a one-inch layer of mulch. 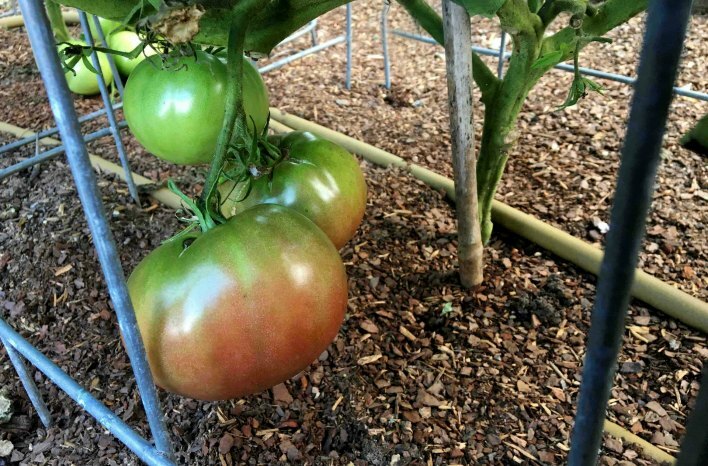 While mulch offers a number of benefits in the garden, under tomato plants, it acts as a protective barrier from soil-borne diseases that can splash up to infect the foliage – one of the indirect threats leading to sunscald. Equally important is to avoid overhead irrigation. Soaker hoses and drip irrigation as seen here, go a long way to helping reduce the risk of water-related diseases on foliage. Keep fruit shaded. To reduce chances of sunscald impacting your tomatoes or peppers, maintain a level of shade cover over fruit as long as possible. If foliage removal around fruit is necessary before maturity, you can provide supplemental cover with shade cloth or similar to mitigate direct exposure. Proactively stay ahead of diseases. Do all you can to defer or minimize plant diseases that commonly impact foliage which should be removed from the plant to reduce the chances of spreading. One of the best ways to do that is to always avoid overhead watering. 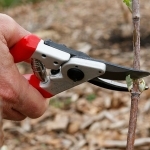 Instead, opt for drip irrigation or soaker hoses to ensure foliage stays as dry as possible. Add mulch. A one-inch layer of mulch under my tomato plants is a must. 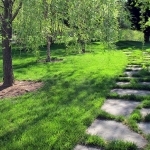 While mulch provides many benefits in the garden, it provides a protective barrier against soil-borne diseases from splashing up onto plants and affecting lower foliage. Consider an organic fungicide. As a preventative control, or to slow the spread of fungus or bacterial disease already present, I use liquid copper spray. It’s a disease control method considered acceptable for use in organic production. While it won’t cure what’s already there, it can halt or slow the spread. Try disease resistant varieties. Consider growing verticillium and fusarium wilt resistant varieties. They’re labeled with a “V” or “F” on the tag to indicate their respective resistance. However, keep in mind, “resistant” varieties are just that. They are not immune to those or other diseases. But it can slow the spread or likelihood of foliage diseases leading to reduced shade cover over fruit later. 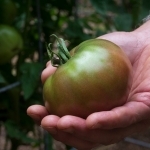 If healthy tomato fruit is starting to show signs of color (known as the breaker stage), consider removing the fruit from the plant and eliminate the risk of sunscald and many other potential threats including other diseases, pests both big and small, as well as splitting or cracking that occurs all too often when plants are left to fully ripen on the vine. 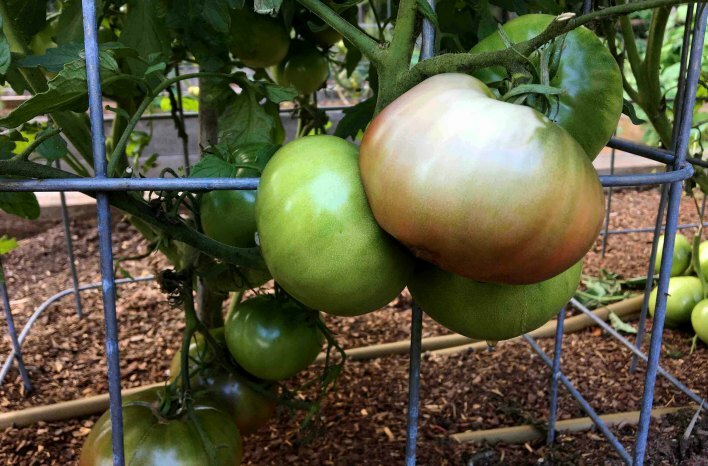 Harvesting tomatoes at this breaker stage will eliminate many of these risks as the fruit will continue to ripen to full color and flavor off the vine and away from exposure. If sunscald occurs during the breaker stage, despite its rather unappetizing appearance, blemished fruit is still edible at the early stages. (The featured image at the top of this post is a good example of that.) Simply remove the fruit from the plant and allow to finish ripening indoors. Then, cut out the discolored areas when ready to eat. When is the Best Time to Pick a Tomato?